For many patients with serious burn wounds, the most dreaded visitor each day is the doctor or nurse who arrives to change the bandages. But accelerator-treated bandages can create healing environment. For many patients with serious burn wounds, the most dreaded visitor each day is the doctor or nurse who arrives to change the bandages. Medical staff members uncover and clean burn wounds regularly to prevent infection. Unfortunately, peeling away materials such as gauze can damage delicate, newly grown skin. And it can hurt. To address these problems, some medical personnel use an alternative type of covering, one created using a particle accelerator. This material, called a hydrogel, has a consistency similar to that of a contact lens. Hydrogels are made by dissolving certain polymers in low concentrations of water and then treating them with an electron beam. This weaves the inner structure of the hydrogel into a molecular net, allowing it to hold moisture while retaining its shape. 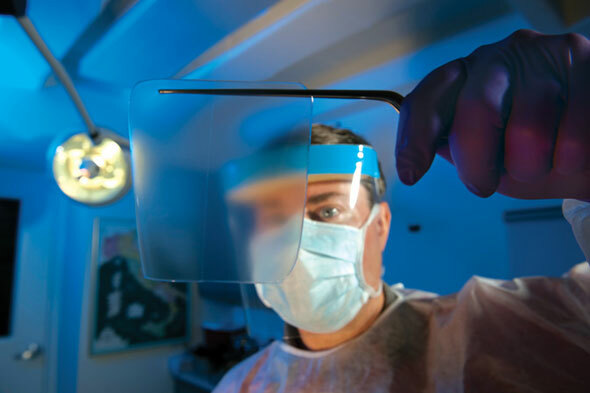 Hydrogels are sterile and disposable. They prevent the formation of scar tissue and can be modified with antimicrobial agents to prevent infection in wounds or burns. The bandages adhere to wounds, but they do not dry and stick the way gauze does. Dermatologist Kyomi Mihara and other staff at Nagasaki Hospital in Japan have been using hydrogels on a few patients each week for the past five years. They act like the bodys own tissue, Mihara says. They can work as a pseudo-blister, creating an ideal environment for burn wounds to heal, she says. Beyond that, hydrogels absorb the liquid a wound exudes. And because they are transparent, medical professionals can continuously supervise the healing process without uncovering the wound. Hydrogels were developed in the United States in the 1960s, and companies in the US and United Kingdom have sold them for years for burn and wound treatment. Researchers in other countries, such as Japan, Egypt, Italy, Israel, Poland, Brazil, Belarus, and Iran, have begun to investigate similar products. In addition, researchers from the Forum for Nuclear Cooperation in Asia, an organization dedicated to the development of nuclear technology for peaceful purposes, are studying the materials properties. FNCA member states—Japan, Australia, Bangladesh, China, Indonesia, Korea, Malaysia, the Philippines, Thailand, and Vietnam—are experimenting with making hydrogels with different liquids and polymers as bases. We are trying to disseminate our knowledge of hydrogels to developing countries, says Sueo Machi, a member of FNCA and senior advisor to the Japan Atomic Energy Agency. Scientists have not limited their inquiry into the uses of hydrogels to the burn ward. They hope to adapt similar materials for other tasks, such as serving as synthetic cartilage for patients with arthritis. They also are investigating its usefulness in non-medical applications, such as improving crop irrigation in desert environments. Mixed with soil, hydrogels hold rainwater when the ground is oversaturated and release it when the soil is dry.